Tricks and treats alike tramp well-heeled and cloven-hooved on Halloween. The city is crawling with fun and waiting to get into trouble. But not too much trouble, as there are still some bumps in the night that could make Tim Burton jump. The holiday is known as a time when dark ghouls crawl slimy from cracks deeper than imagination, but that’s a load of hooey. Georgia State University Police Department Chief, Joseph Spillane, said students don’t need to worry about witches or goblins. When it comes to crime, Halloween is just like any other day. No reason not to be careful, especially with all the tools available. You can coordinate your group in the group chat, check up on each other. The school provides the LiveSafe app, which connects you to campus police. But if it would make you more comfortable, there are a variety of safety apps such as Shake2Safety and Circle of 6, both of which can be set to send out distress alerts to select contacts. Spillane said he wants to give students advice for navigating campus after dark. “Stay in groups. Don’t go anywhere alone in the city. Not even on campus,” Spillane said. Yes, the same advice you scream at characters on screen, in horror movies can be useful offscreen for your night out. Groups deter violence, so squad up. And if you ever feel out of your element or cool, don’t hesitate to ask for help. “If you feel unsafe, give us a call and we’ll be happy to give you a ride,” Spillane said. And he means it. Spillane estimated GSUPD gives about 30 rides to students a day — mostly in the evening across campus, after late school functions, library studying or other less responsible activities. Campus organizations such as fraternities are usually the ones throwing Halloween parties. Risk Management head, Nahom Taye of Alpha Tau Omega said it’s all about prevention to make sure the parties are a safe environment for everyone, on days not only reserved for Halloween. Taye said ATO has found that enforcement of a set guest list, alcohol monitoring and sober monitors best ensure the safety of the party and its attendees. Guest lists are to make sure everyone at the party is trusted and their behavior vouched for. “We have a set guest list. We make sure we know everyone who gets in. We put in steps so we don’t have to question every guy when I’m looking around in the party,” Taye said. ATO monitors alcohol consumption by enforcing a ticket system. Their parties are strictly BYOB, (“bring your own beer”), and whoever brings the beer is the only one who can drink it. Spiked drinks are a big concern for college aged students and with BYOB, people can only consume what they brought. They also turn away anyone with hard liquor. That way, the night doesn’t turn dangerous with anyone becoming too aggressively drunk or starting any fights. And if something were to happen at a party, with sober monitors, there are always people easily accessible and in the right state of mind to handle the situation at hand. 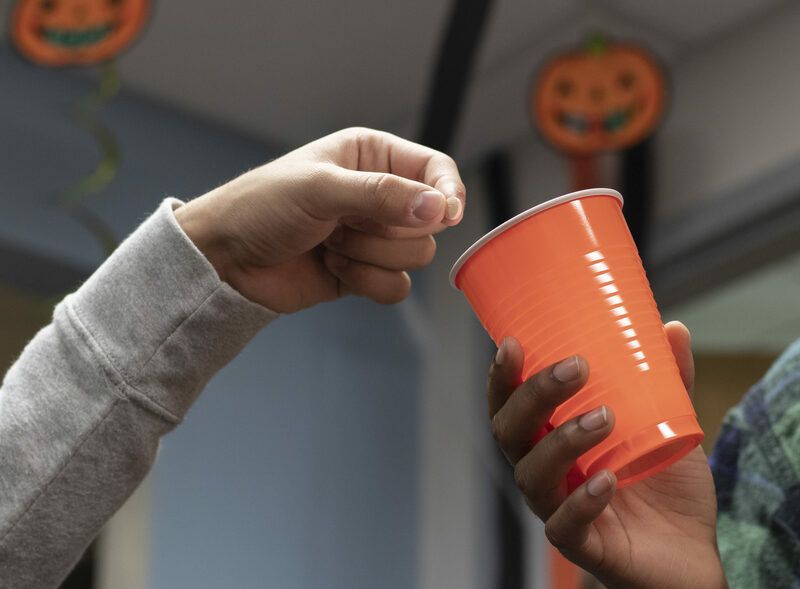 “They have either a neon hat or something distinguishable during the party so if they ever need someone, they have someone trusted they can go to,” Taye said. Taye said with all of these prevention measures in place, ATO cuts back on any possibly dangerous situation so that both men and women can feel comfortable at their parties. “The point of a guest list, managing how much alcohol everyone consumes, sober monitorings, all of those are in place so that stuff never happens. Because all of it leads to that,” Taye said. So this Halloween, stick in groups and watch out if you’re walking around Downtown after dark. Make sure you feel comfortable with the people at your party and know if there’s someone trusted you can go to in any emergency. Be wary of communal punch and be sure to inspect whatever spider web designed cookies at the party you go to, even if a surprise Halloween edible is the least of your worries. Be sure you can see effectively out of your mask. Don’t let your costume impair your visibility. Be aware of exits. Just a small precaution but you always want to know at least two. Don’t put your drink down in an unfamiliar place and keep both your eye and your hand on the opening as your drink can still be targeted while in your hand. Redownload LiveSafe. That track-a-friend feature can help you feel so much safer. Have enough charge on your phone for the Lyft or Uber home.